Every Thursday, my Twitter feed undergoes a transformation. That’s because on Twitter, Thurdays are Folklore Thursdays. #Folklorethursday is a hashtag created by British folklore scholars Dee Dee Chaney, Willow C. Winsham and Seline Stevenson. It first hit Twitter on June 18, 2015. Throughout the day, Chaney, Winsham and others moderate tweets from writers, folklorists, historians, scholars and bloggers like little ol’ me as they share links, pictures and tweets about folklore. And I know what you must be thinking, all that scholarly material, it must be kind of dry and boring. You couldn’t be more wrong. Though it might be reasonably scholarly material, Folklore Thursday tends to overflow with the exotic and the bizarre. Every Thursday, my Twitter feed flows over with strange home remedies that require the use of unusual herbs or animal parts, ways to ward off the evil eye or guard oneself from witches, strange customs and superstitions from far away countries and more cryptozoological beasts than you can shake a stick at. But now, onto the most important questions about Folklore Thursday. How can I receive Folklore Thursday tweets in my Twitter feed? Simple enough. Simply follow the @FolkloreThurs account on Twitter. Is there a way I can participate in Folklore Thursday? Yes! The first step is to find something folklore related online. 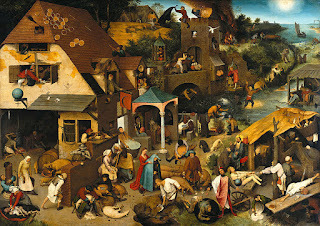 When I started participating in Folklore Thursday, I used my own “The Stuff of Legends” posts. Then, write up your tweet, include your link and add the hashtag #folklorethursday and send it off. Any special tips for taking part in Folklore Thursday? I have one tip for my fellow American participants: remember that the headquarters for Folklore Thursday is in the UK. Because of time zones, Britain’s Thursday starts and ends several hours earlier than ours does. So, Folklore Thursday will likely be underway by the time you start your day. So, it might be necessary to get your tweet sorted the day before (picking the link, etc) so you can tweet it right when you get the first chance on Thursday. If I can’t get enough of Folklore Thursday, where can I get more? They have a website where many of the more interesting links and articles from Folklore Thursday are showcased. It’s at folklorethursday.com. Are there any folklore based life tips you’d like to give us? Yes. Always crush your eggshells when you use eggs in your cooking. That way, witches can’t use them as little boats to cause trouble at sea. This is just one of the many tips I’ve picked up from following Folklore Thursday. So, I hope this post has made you aware of something cool and fun that’s worth checking out. It can be a little strange, but I find it can be a good weekly pick-me-up with times the way they are now. Also, I’m not kidding about that eggshell thing. We can’t let those witches cause trouble at sea, now can we! The name Classics Illustrated is famous in comic book circles. The series, known for adapting works of classic literature, is remembered by comic book fans not only for producing an impressive run of comics but also for being one of the first attempts at classing up the medium and the first introduction many people had to stories from great literature. 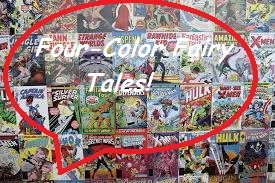 Many people forget though that Classics Illustrated had a spin-off series focused on myths and fairy tales entitled Classics Illustrated Junior. Now, comics of this vintage are not always easy to get a hold of, but I saw a box of them at my friendly neighborhood comic shop. I picked up four issues: Pinocchio, The Frog Prince, The Dancing Princesses and King Thrushbeard. So, how do these comics stack up? Well, the thing to remember here is that these comics are all from the 1950s and were aimed at very young kids. I mean, Classics Illustrated was definitely aimed at kids, Classics Illustrated Junior must have been aimed at even younger ones. But let’s break it down. Pinocchio- This adaptation of Carlo Collodi’s book is pretty faithful except that everything is very condensed. Certain events from the book are left out. For example, the parts with Mr. Cherry at the beginning of the story are taken out. There are also no run-ins with the Green Fisherman or Melampo the Mastiff. The violence is also greatly toned down. One of the most infamous scenes in the book is the one where the Fox and Cat hang Pinocchio from a tree by the neck. This version avoids the execution style hanging and has the Fox and Cat truss Pinocchio up around the middle so his hands are tied and hangs him from there. So, instead of looking like an executed man, the naughty puppet looks a bit more like some sort of awkwardly designed Christmas tree ornament. In addition, the Cricket gets chased off rather than squished and the giant dogfish that swallows Pinoccchio is just a generic (though gigantic) fish. The Frog Prince- Of the four comics I picked up, this is probably the only one where the story is stretched out rather than condensed. The princess spends a lot more time offering the frog gold and jewels to retrieve her golden ball. The princess also receives a dream sequence in this version that shows her transformed into a frog and abused by a little boy. Now, you’re probably wondering about the ending. Does she kiss the frog? Does she chuck it at a wall like in the Grimms’ book? Neither. After she wakes up from her dream sequence, she feels bad about the frog having to sleep on the cold, hard floor. So, she picks it up and puts it on a pillow. When she wakes up the next morning there’s a prince lying there on her floor. This version seems to draw on two different variants of the tale that I know of, which is an interesting thing to see in a vintage comic book like this one. The Dancing Princesses- This is another story that is mainly changed in the sense that elements are condensed. The soldier’s three nights to discover where the princesses are going is reduced to one. So, everything is happening much faster. There are also some elements that speak more to the era and the age group that this comic was made for. Instead of being executed, the princes who fail at finding where the princesses are going are banished. Also, all mentions of alcohol are changed. Instead of being brought a cup of wine with a sleeping drug in it, the soldier is brought a cup of milk with a sleeping drug in it. They also make a point to mention that it’s lemonade that everyone is drinking at the underground ball (making a secret magic, mysterious rendezvous seem more like a very unusual church social or high school dance). One thing that really stands out though, is that they go to the trouble of naming all of the mysterious princes (Stanley, Albert, Conrad, Armand, William, Rudolph, Alex, Aladar, Michael, Oscar and Robert), while only two of the princesses (Flora and Hilda) are named. I don’t want to say it’s a sexist move, but it certainly seems like one. The comic also makes another change that I’ve been known to make when telling the story. The soldier (named Felix here) ends up with not the oldest sister but the youngest. Probably because the youngest sister is the only one who seems particularly sympathetic. King Thrushbeard- This one is more or less the same except the haughty princess is given some rhyming couplets to insult her rejected suitors with. I kind of wish I could say this comic is better than the traditional story because this story doesn’t have the best reputation. It’s sort of the “Taming of the Shrew” of fairy tales in the way it treats its main female character. I’ve got a soft spot for it because I like tales that feature some degree of trickery and deception, but yeah I can totally see the issue here. And an adaptation from the 1950s certainly isn’t going to fix that. Each issue also includes an Aesop’s fable a page of animal facts and a couple of children’s poems and nursery rhymes. The art is about what you’d expect from fairy tale adaptations from the ‘50s. A lot of clean cut young men and women in fantasy garb. This isn’t the first time I’ve covered fairy tale comics from this time period. Remember my piece on Walt Kelly’s Fairy Tales? So, we didn’t really encounter anything here we haven’t seen before. I think maybe the biggest revelation is just how young they were trying to skew the demographic for fairy tales. I mean, if Classics Illustrated was already meant for kids, who was Classics Illustrated Junior meant for? Pre-schoolers? It’s kind of a reminder in these days when everyone’s saying “Fairy tales aren’t really for kids” how much we bend the tales to make them fit the demographic we want them to fit. We may even be bending them a bit even now to make them the terribly “adult” tales we want them to be. It makes you think. 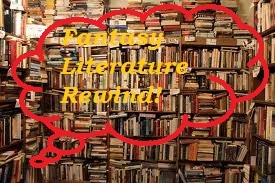 Fantasy Literature Rewind: The Reluctant Dragon. In this age of Disney remakes, I find I usually wait until just before the new film version of the story has been released before writing up a Fantasy Literature Rewind column. But, you know, I just don’t see Disney’s version of “The Reluctant Dragon” getting remade as a feature. Especially since they already did a dragon movie. “The Reluctant Dragon” is a short children’s story by Scottish author Kenneth Grahame. The story was originally published in 1898 in a short story collection entitled Dream Days. Grahame himself is probably best known for writing the children’s story The Wind in the Willows (another story that’s been Disney adapted but which I can’t picture being remade any time soon). “The Reluctant Dragon” is one of Grahame’s more popular short stories. It’s been adapted a number of times for television. Rankin-Bass, famed for their many Christmas specials, even paired the dragon with another of Grahame’s popular characters for a cartoon titled The Reluctant Dragon and Mr. Toad Show. The story starts out with a boy, simply called “the Boy” throughout the entire story who lives near the Downs in England. Now, this boy spent much of his time reading fairy tales and natural history, such that they ran together and he started to consider the two to be one and the same. This is why he isn’t all that surprised when his father comes home from herding his sheep talking about a terrible creature he saw in one of the caves nearby. The Boy figures it’s a dragon and goes to have a chat with it. Upon meeting the dragon he’s surprised to find that the dragon isn’t a desperate fire-breathing beast that likes fighting knights at all. Instead, he’s a polite, somewhat lazy homebody who enjoys writing poetry. The Boy and the Dragon become good friends. However, it’s not really to last. The locals have found out about the dragon and have decided that something has to be done about it. This is partially because they think the dragon must be a monster and partially because they just want there to be a fight they can watch. The townsfolk don’t really have anything they can do about it until St. George comes to town (yes, that St. George). 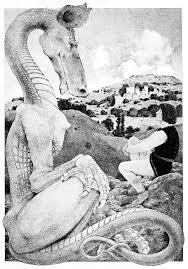 Upon warning the dragon that St. George is coming, the Boy gets roped into talking to George which in turn escalates into him setting up a meeting between St. George and the Dragon. That meeting leads to a rather humorous staged fight in which the dragon is supposedly injured and is then reformed, allowing him to take a place in society. I usually don’t give away the endings of stories, but I kind of felt I needed to in order to give a full picture here. You can still read the story HERE. This version actually starts with a sort of framing device that my print copy doesn’t have. Now, as is probably evident, this story is a take on the popular legend of “St. George and the Dragon” (a legend I talked about in The Stuff of Legends). Now, the thing to remember is that this legend is a huge deal in England. This is probably because St. George is considered to be the patron saint of England. Never mind the fact that the story of Saint George fighting the dragon supposedly happened in Libya. It’s easy to just see “The Reluctant Dragon” as a spoof or satire of the popular “knight fights dragon” archetype. However, I also can’t help but think maybe it was also Kenneth Grahame’s way of poking some fun at the English society of the time period using one of their most beloved stories. While Grahame may have been Scottish it’s true, he did spend some time in England even going to university there. Also, with England being the seat of power for the United Kingdom, it was and still is a country that casts a long shadow over the rest of the British Isles. It’s really the contradictions within the story that bring up thoughts of Victorian England. The dragon is gentle and poetic while the townsfolk are more bloodthirsty and desiring for violent conflict, at least as spectators. Even the boy wanted to see a “proper fight”. Just as Britain was a big, warlike colonial power at the time that identified with the legend of the heroic Saint George while also in some circles being preoccupied with subjects like social class, propriety and civility. Maybe it’s a bit of a stretch. But what really gets me and makes me think the story is a poke at English society is the way that the concept of the fight is proposed to the dragon. Both Saint George and the Boy frame the idea of the battle as a matter of propriety. For a dragon to not fight a knight after the challenge is issued is simply not done. On top of that, the Dragon’s reasoning for agreeing to the staged fight is so that after he’s reformed he may enter society. In other words, it would help his social standing. I could be completely off. I myself am not English and have not given a whole lot of time to the study of Victorian English society. So, if any of my readers are more knowledgeable about the subject, please let me know. But still, “The Reluctant Dragon” is a fun story and might give you something to think about.